A thousand dollars in annual credit card fees might seem crazier than... well, the cost of a first class seat bought with cash, but the two best premium travel rewards cards really aren’t in direct competition, and those fees feel very different in practice than they look on paper. Once their sticker shock has worn off, credit card fees should be thought of in terms of absolute value. If a hotel-branded credit card has an annual fee of $49, but you get a free night annually at any of their hotels, you should definitely be coming out ahead in that exchange. The Chase Sapphire Reserve has an annual fee of $450 that’s immediately chopped down by a $300 travel credit that applies to everything you can think of. Things are more subjective from there, as regular travelers likely already have TSA Pre✓/Global Entry. The American Express Platinum has a $550 annual fee, but apply your $200 Uber credit (doled out in up to $15 monthly increments and up to $35 in December) and you’re down to $350. The Platinum’s $200 airline fee credit isn’t anywhere near as easy to use as the Reserve’s $300 travel credit, but once you choose an airline to apply it to, it’ll go quickly. I use mine on JetBlue Even More Space seats. So again we arrive at a $150 remainder. While the annual fee of the Platinum starts $100 higher, I’d argue this card does an even better job of canceling it out before you even start thinking about points. The Platinum also brings with it TSA Pre✓/Global Entry and Priority Pass, but adds Centurion Lounges, Delta Sky Clubs, and Airspace Lounges, which equates to the best lounge access of any credit card. Then there’s what is in my opinion the crown jewel of credit card perks: Gold status at Starwood, Marriot, and Hilton. Gold hotel status simply isn’t obtainable or maintainable for most people, and it’s hard to imagine anyone who spends a lot of nights in hotels not valuing this benefit at way more than $150. You’ll earn more with your Amex Platinum on airfare booked directly with airlines or with Amex Travel, and on prepaid hotel stays booked with Amex Travel, than you would on those same purchases using your Sapphire Reserve, 5X vs. 3X, but that’s a weird and narrow comparison. Chase’s Ultimate Rewards ecosystem, taken in totality, is going to out earn the Platinum is most categories and circumstances, and that’s before thinking about all the other credit cards, like co-branded cards, you might also have in your arsenal. 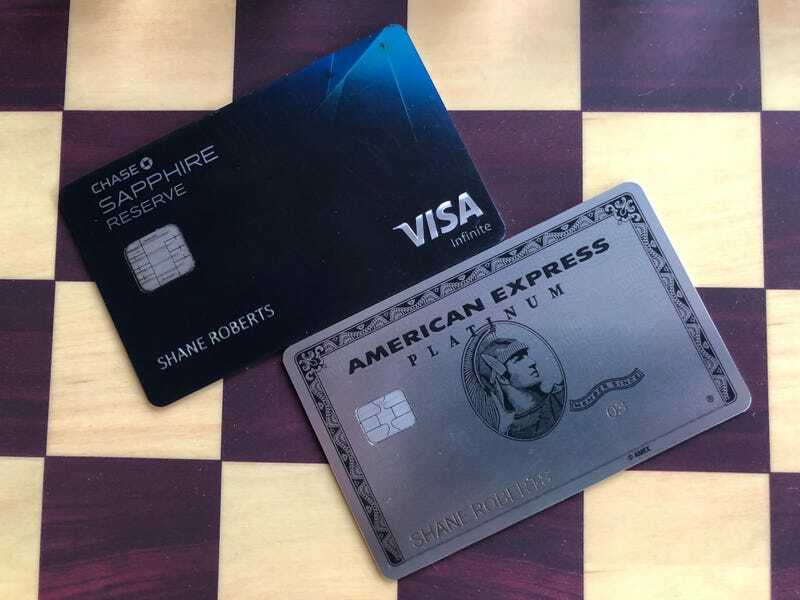 The Chase Sapphire Reserve (and its accompanying ecosystem) is an earnings card, while the American Express Platinum is a membership and perk card. Both these cards effectively and immediately negate all but $150 on their annual fees, and I would argue, that $150 as well, depending on how you value their perks. Both these cards are worth getting for their sign-up bonuses alone, which we didn’t even talk about here. Dig in to our coverage of all these cards for more detail on their respective benefits. Hold both and you’ll be one happy, flush with points traveler.